Well, I got my $250 rebate debit card from Canon for my Pixma Pro 100, and I found it gives an extra 5% if you buy from certain shops, Crutchfield is one. I think I may have come residual credits there too....so, looking around I found the DJI-Ronin S gimbal there and it looked pretty fun. Has anyone any hands on experience with these? Do they work? Would they still be functional, with an older camera like the 5D3? Can you pull focus with it? Just wondering if anyone has used it yet and if so, can you please give me some info and review on it? Looks to not only work well as gimbal for DSLR's...but has some neat programmable modes for panos, and the like too. I'm wondering if a EOS RP would be a good choice for a FF drone application. Weight matters a huge amount as far as drone performance, and its obviously better for gimbals as well. The camera control software is similar so it might work as well. I have the Ronin-S, I actually got the Zhiyun Crane 2 first but literally had it a few days before I lost it. The Ronin-S I have found to be a bit of a frustration, I do very little video but was interested in the programable ability to do panning and tracking time lapses, DJI were very slow to release camera compatibility though the situation has improved somewhat now. The Ronin-S gives very smooth video, which in all honesty is it's primary function, from the footage I have seen it is smoother than the Zhiyun Crane 2 and the Moza Air 2. Take a look at the Moza Air 2 as it has a richer feature set than the other two and there seems to be a bit of a price war going on between them all at the moment. Forgot to add, the 5D MkIII does have control compatibility but you need to buy a cable that doesn't come with the gimbal, it is proprietary on one end. I don't have first hand experience of the 5D MkIII on a Ronin-S, I'd take what they say with a pinch of salt now but there are active forums (not here) that are very capable of answering your specific queries. The pull focus does now work with my 1DX MkII's and so does the shutter release so I can now do my panning time lapses! and here is the compatibility pdf. 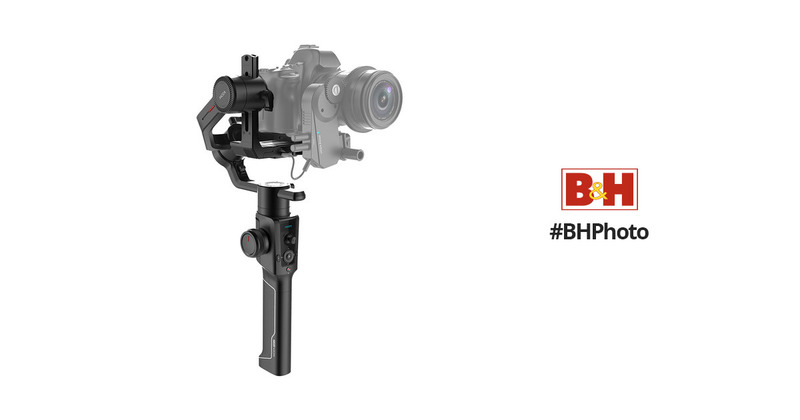 And right on queue, B&H have the Moza Air 2 $100 off for 24 hours. At $499 it is very good value! Once again, thank you for the prompt response and great info and advice!!! I'll delve into these links a bit more. I have the DJI Spark and I'm used to their software, I find it pretty easy to use...I have the old Osmo that you use with an iPhone, so I'm guessing the Ronin S will be quite similar. That price on the MOzaAir does look tempting too...I saw a video on it yesterday and will look at it a bit more too. I also, last night, saw videos using the Ronin S with the Blackmagic Pocket Cinema Camera 4K too....and I'm looking to maybe get one of those later this year and it would be neat to use with the Ronin.